Pope Francis is scheduled to meet with Vladimir Putin later this week at the Vatican. 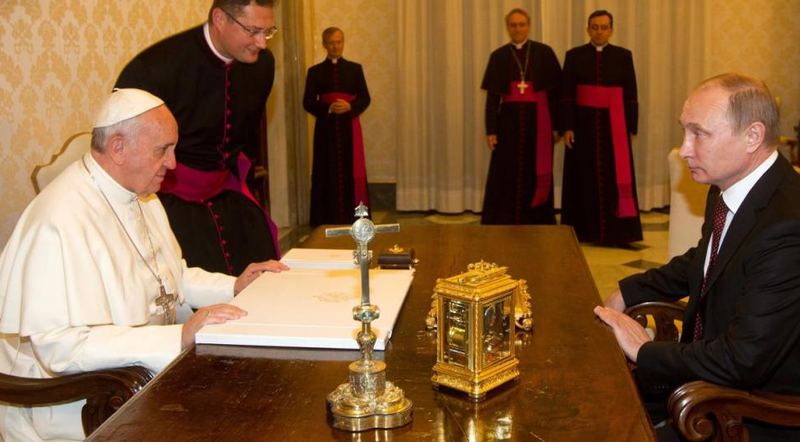 No doubt the conflicts in Ukraine and Syria will be foremost on the Pope's mind. The above image was taken from their last meeting in November 2013. Putin's facial expression in this moment displays a forehead contraction (across its entire width) together with partially closed upper eyelids. This nonverbal cluster sends signals of arrogance and impatient-dismissal (e.g., a la' Marshawn Lynch, "I'm just here so I don't get fined/more trade sanctions, etc.") - Emotions which Vladimir projects frequently. Not to be overlooked is Vladimir's lack of hand visibility. In the best case scenario, when the hands are not visible or mostly covered, a person is projecting beta emotions and/or disengaged. In addition, those individuals in the process of lying will (subconsciously) very often keep their hands below the table or otherwise hidden. Those who wish to build rapport and engender trust should keep their hands in view. Nonverbal Communication Analysis No. 3083: Marshawn Lynch Interview, "I'm just here so I won't get fined"